The risky choice of the soft rear tyre paid off for Aleix Espargaró, who finished in the points, the third time in a row for the Spanish rider and particularly significant because it was earned on one of the most difficult tracks for the RS-GP. 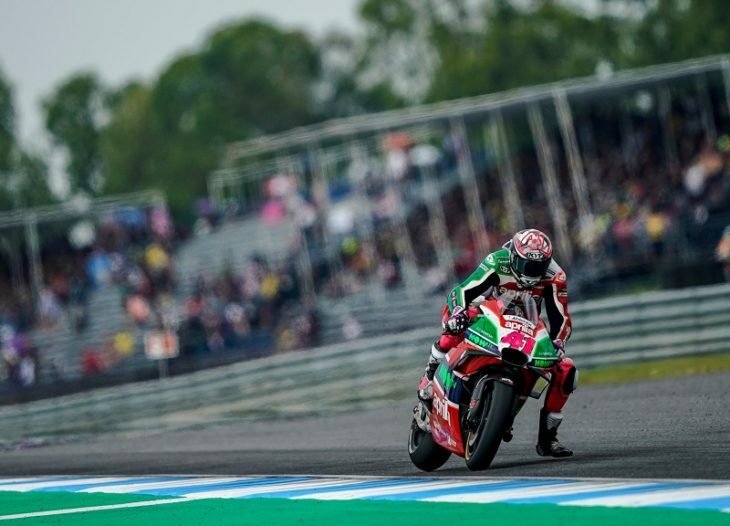 Aleix skilfully managed his Aprilia’s grip, maintaining contact with the top 10 in the early stage of the race and doing his fastest lap on the fifteenth, just 5 tenths behind the leading time. Scott Redding took advantage of an excellent start where he gained 7 positions during the first lap. The British rider then rode a consistent race, just missing the points zone by a few tenths, but expressing satisfaction after the race in terms of his feeling with the RS-GP on the Thai track. ALEIX ESPARGARO’“The soft tyre, in my opinion, was the best possible choice today. I discussed it at length yesterday with the team and with the Michelin technicians. There were some doubts on duration and, on the final laps, I actually did prefer to maintain my position without risking. In any case, I think that I achieved as much as was possible today on this track that is definitely one of the most difficult on the calendar for us. Thirteenth place and two points cannot be fully satisfying. We need to improve, and we are well aware of our weak points.